95 Lake Shore Blvd East Condos is a new per-construction Condo project located at 95 Lake Shore Blvd East in Toronto.The Major Intersection are Yonge and Lakeshore Blvd East. Developed by Menkes. 95 Lake Shore Blvd East Condos have 79 and 80-storeys. 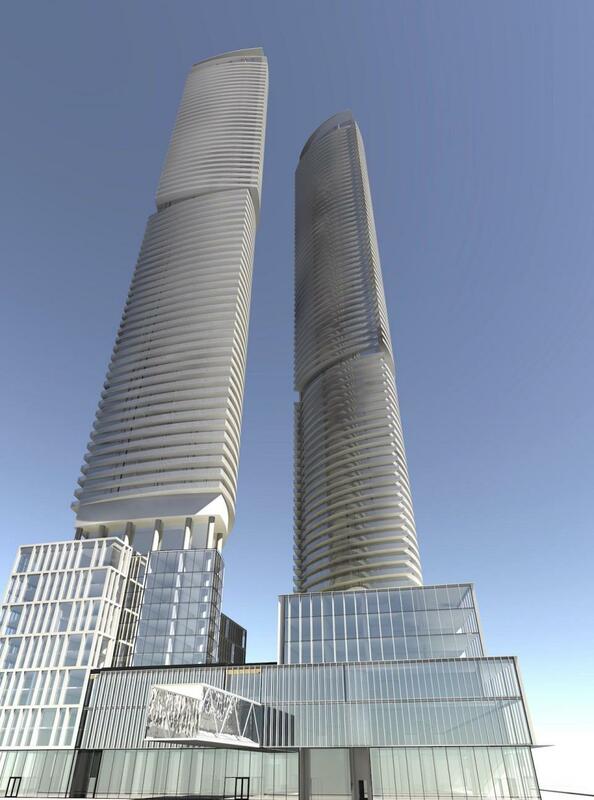 ArchitectsAlliance-designed residential towers to rise on the northeast quadrant of the LCBO Lands on Queens Quay Boulevard East in Toronto’s Lower Yonge Precinct Area. The Menkes development will include a new LCBO headquarters office tower to the south, a park to the southwest, and more condominiums and a public school to the west. The complex will be tied together through an extension to Toronto’s PATH system.Total 1927 Units. Step to shops, dining, and Entertainment. 95 Lake Shore Blvd East Condos have a total of 1,927 condominium units are proposed, coming in a mix of 65 bachelor, 1,078 one-bedroom, 593 two-bedroom, and 191 three-or-more bedroom units. While the large offering of one-bedroom units serves to address market demand, the project’s contribution of numerous two and three-bedroom units would create new housing opportunities for families along the waterfront. 95 Lake Shore Blvd East Condos Residents would be served by a four-level underground parking garage containing 478 parking spaces, including 416 spaces for residents and 62 for visitors. In addition, 1,971 bicycle parking spaces would be provided, creating what could very well be one of the largest bicycle parking facilities in the city. 95 Lake Shore Blvd East Condos has a Walk Score of 95 out of 100. Transit score of 100 out of 100. This location is in the Waterfront Communities-The Island neighborhood in Toronto. Nearby parks include Berczy Park, Sculpture Gardens and St. James Park. Lake Shore Blvd E & Cooper St.